Product prices and availability are accurate as of 2019-04-18 02:00:14 EDT and are subject to change. Any price and availability information displayed on http://www.amazon.com/ at the time of purchase will apply to the purchase of this product. 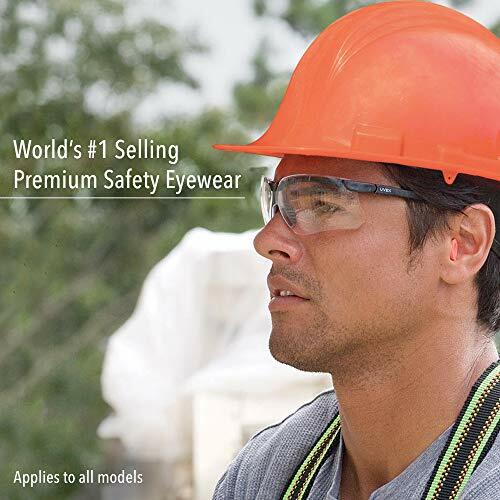 Uvex Genesis Safety Glasses are engineered for comfort, protection and style, Our Genesis line is the number one selling premium protective eyewear in the market, delivering an incredible range of superior product benefits. 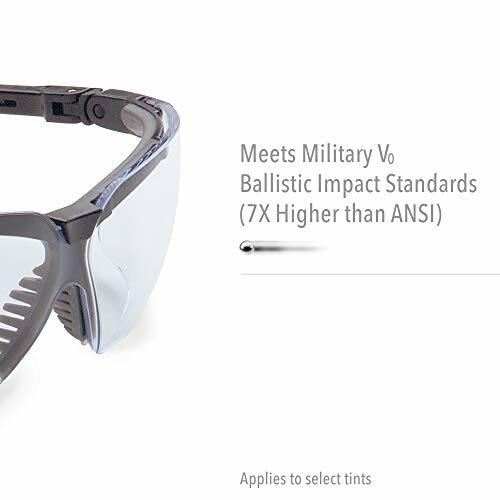 Built with MMT (Multi-Material Technology), these safety glasses offer the highest available impact safety: military V0 ballistic test protection against impact energies 7X higher than ANSI requirements (on select tints). They are also certified to meet CSA Z94.3 standards. Some models also feature an advanced TPE frame formulation that performs exceptionally well in environments where chemical mist, cutting oils and high moisture are present. 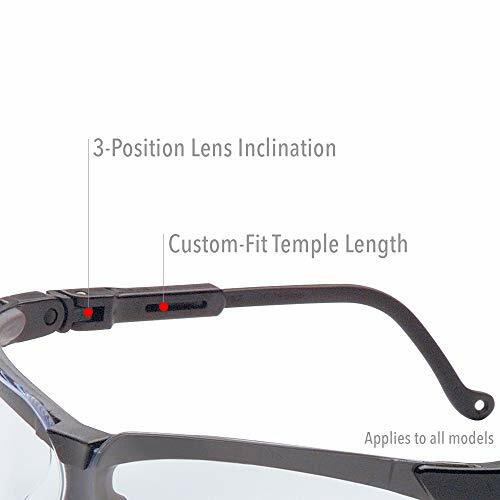 The wraparound 9-base uni-lens offers excellent side coverage and peripheral vision, and the adjustable temple length & lens inclination makes for a truly customized fit. Unique comfort features include a soft elastomer browguard to diffuse impacts, and soft, flexible nose fingers that reduce slippage and conform to almost any nasal profile. A ventilation channel between the frame and lens vents the eye socket area to deliver an outstanding level of moisture and fog control. 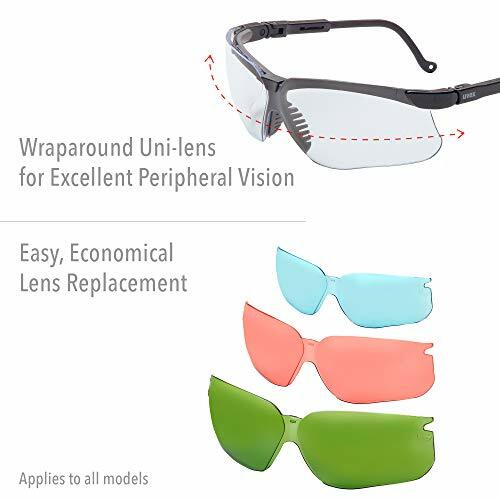 Genesis safety eyewear also boasts an easy and economical lens replacement system to extend the life of your glasses. 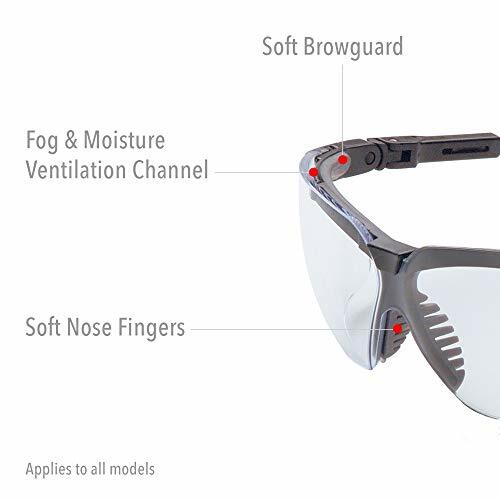 Uvex Genesis Safety Glasses are available with multiple lens tints to suit almost any work environment. Uvex stands for "Ultra Violet Excluded", which means our safety glasses employ specifically formulated resins that filter 99.9% of the UV radiation in accordance to the U6 scale of the Z87 standard. Uvex has also developed Spectrum Control Technology (SCT), which incorporates unique dyes designed to absorb select wavelengths of radiant energy (light). Our anti-glare glasses, tinted safety glasses and safety sunglasses are designed to manipulate light to reduce a spectral hazard, or to provide distinctive filtration for specific safety eyewear viewing tasks. Examples include filtering solar radiation to reduce glare, and blocking radiation from welding to protect workers around these operations. Multiple anti-fog and anti-scratch coatings are also available. The new HydroShield technology provides our best anti-fog lens coating, keeping your vision clear up to 90X longer than most other competitive anti-fog safety glasses. The Uvextreme anti-fog coating offers great, dual-action performance under demanding hot and humid conditions for long lasting fog-free performance. Our Ultra-Dura hardcoat makes for some of the toughest scratch-resistant safety glasses in the world. 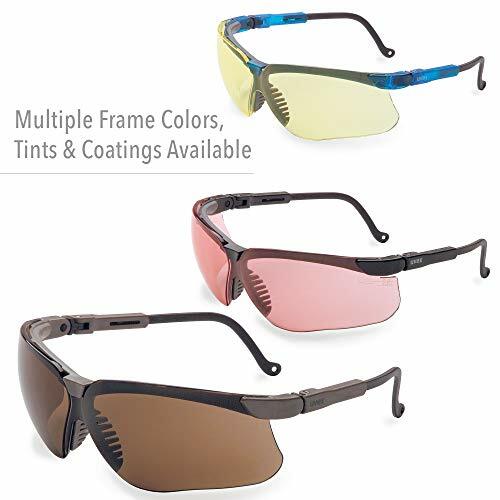 Permanently bonded to the lens, it offers unparalleled scratch and chemical resistance. The dual anti-fog/anti-scratch Dura-Streme coating combines the benefits of our industry-leading Uvextreme anti-fog coating and our Ultra-Dura anti-scratch hardcoat. While the advanced anti-fog properties of Uvextreme help keep the interior of the lens clear from fogging, the rugged properties of Ultra-Dura protect the exterior of the lens from scuffs and scratches, adding up to three times more life to lenses. Shop @ Garage Epoxy is a participant in the Amazon Services LLC Associates Program, an affiliate advertising program designed to provide a means for sites to earn advertising fees by advertising and linking to Amazon.com, Endless.com, MYHABIT.com, SmallParts.com, or AmazonWireless.com. Amazon, the Amazon logo, AmazonSupply, and the AmazonSupply logo are trademarks of Amazon.com, Inc. or its affiliates.